Super Bowl Week unofficially kicked off yesterday with an NHL hockey game at Yankees Stadium. The Rangers spanked the Devils 7-3, delighting the heavily blueshirted crowd. The game was delayed an hour due to sun glare off the ice. It wasn’t a warm glare, mind you; game time temps hovered around 25 degrees. Snow showers later in the day made for great television and a terrific experience for freezing fans. The Seahawks and Broncos arrive today and they’ll be living and practicing in New Jersey. Additional events in the Garden State include a concert by the Goo Goo Dolls tonight in Liberty State Park and Media Day at the Pru Center in Newark tomorrow. Additional information about events on the Jersey side can be found here. Super Bowl Boulevard is the hallmark attraction in NYC and opens on Wednesday. But there’s a ton of stuff going on all week, including food, music, more food, and special sporting events including another outdoor hockey game and a basketball buffet at the Garden on Saturday – St. John’s vs. Marquette, Georgetown vs. Michigan State, Knicks vs. Heat. Since the Jets won’t be playing the big game on Sunday, the team is offering consolation in the way of food and drink for the team’s fans. Jets House is part of a massive tailgate party scheduled for One Penn Plaza. The point is, there’s something for everyone during Super Bowl week. The primary problem is not finding something to do, but finding the time to do it all. So, let the festivities commence! 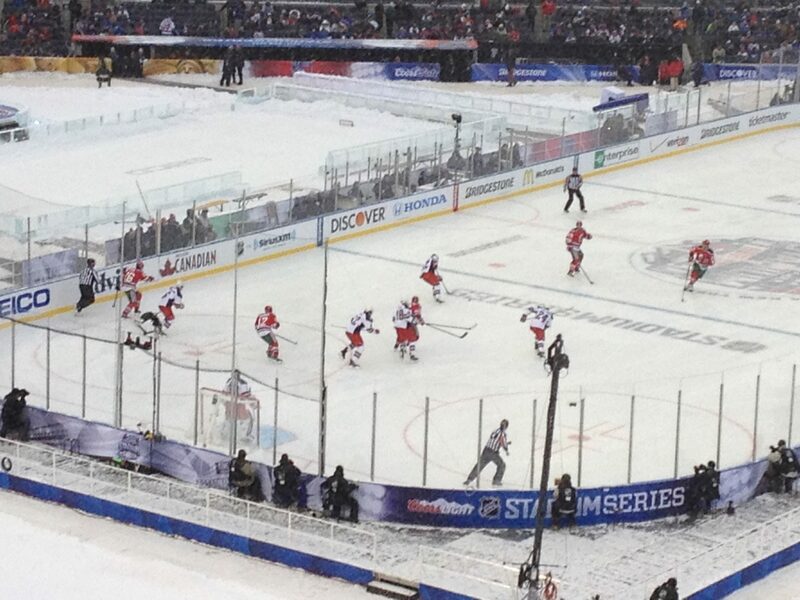 It was great to watch a game the way the pros all learned to skate – outdoors in the cold! The hockey fans were all prepared, wearing ski outfits (including goggles) and loaded with hand and foot warmers. Football fans should take note for Sunday! Thanks for commenting! It’s funny because they even did that in Southern Ca with the Ducks and Kings at Dodger Stadium. I don’t know how they kept it cold enough because we, unlike the rest of the country, are experiencing a warm dry spell. My friend who works for the NHL and was at the game said the conditions were great – I guess 62 degrees is better than 25!